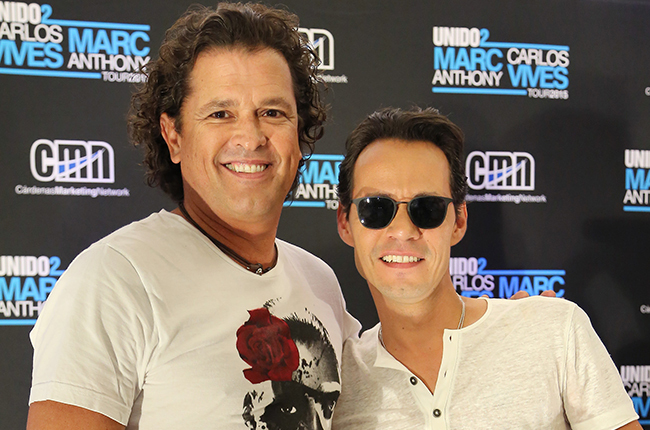 Carlos Vives has a lot of famous friends, and he’s not shy about showing them off. In a social media campaign meant to build hype and drive sales for his Más Corazón Profundo tour, the Colombian tropi-pop king has been unveiling the musical guests who will join him for a special concert dubbed “Vives y sus Amigos” (Vives & Friends) in Bogotá on August 13. So far, the artists confirmed to perform with Vives at the El Campín soccer stadium in front of nearly 50,000 people are reggaeton superstar Wisin, Afro-Colombian trio Chocquibtown, Latin urban breakout sensation Maluma, Brazilian singer Michel Teló, and, as of Tuesday, salsa giant Marc Anthony.